Considered by some to be “the ultimate US flamethrower of World War Two”, the T33 saw one of the more extensive modifications to its foundation M4 hull. It featured a new turret, a new cannon, and a new flame gun. To accommodate the tank’s main gun and new coaxial flame gun, a new turret had to be designed for the T33. It was of cast construction and rather bulbous and large compared to most M4 mounted turrets. The main gun remained in the center of the turret, with the flame gun placed on the right. The projector was protected by a thick tube, which almost gives it the appearance of a short-barreled howitzer. It was a three-man turret. The commander sat in the center at the rear, the loader was positioned on the right and the gunner on the left. This was an unusual arrangement for an American tank, as usual, crew orientation concerning the loader and gunner are the opposite way around. Above the commander was his vision cupola with built-in hatch. The gunner and loader had individual hatches above their positions. The flame gun and cannon were geared together, but could also move independently of each other in elevation. The range of elevation was -15 to +45 degrees. It also had 15 degrees of traverse left and right. The particular flamethrower used in the T33 was the E20-20 (E20 fuel group combined with the E20 flame gun) which was a further development of the POA-CWS-H5 (Pacific Ocean Area-Chemical Weapons Service). This weapon was also designed in 1945 and was earmarked for use in the planned Invasion of Japan. The weapon had a range of 150 yards (137 meters). For a long time, the standard gun of many M4 models was the 75mm Tank Gun M3. To save weight and grant extra space in the new turret, in the T33 this gun was replaced with the 75mm Lightweight Tank Gun M6 which had a concentric recoil system (a hollow tube around the barrel. A space-saving alternative to traditional recoil cylinders). This gun also served as the main armament of the Light Tank M24 Chaffee. Variants of the gun were also used on aircraft such as the B-25H Mitchell Bomber. Though one caliber shorter than the M3 (The M3 Tank Gun was 40-Calibers in length, the M6 was 39), the gun granted the same velocity of 619 m/s (2,031 ft/s) and identical maximum penetration of 109mm. Elevation range of the gun was -10 to +13 degrees. The gun also had a coaxial.30 Cal (7.62mm) Browning Machine Gun which was mounted in between the canon and flame gun. Between 40 and 55 rounds of 75mm ammunition were carried. It was planned that, when available, the M6 gun would be replaced by a new model designated the M17. This gun was similar to the M6, but saw the introduction of a muzzle brake. The replacement would never take place, however, as no M17s would enter production. 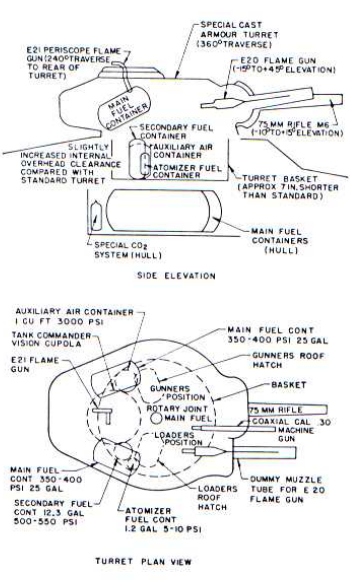 Originally, there was a specification to add an Auxiliary E21 Flame Gun to amount installed on the commander’s cupola. It could traverse 240 degrees left and right, providing close range protection from attacking infantry. It was blocked firing directly forward to avoid flaming liquid pooling on the turret roof. When the T33 pilot was constructed, the E21 was replaced with the E12R4. This was also a small auxiliary flamethrower. Two large fuel tanks were placed on the hull floor, with two smaller ones located on the left and right of the turret bustle. Total fuel capacity for the flame guns was 250 US Gallons (1137 liters). To begin with, the tank also retained the original M4 crew of 5 (commander, gunner, and loader in the turret, with the driver and co-driver/bow gunner in the forward hull. This soon dropped to four men, however, when the bow machine gun was removed. The void was welded over. Artist’s interpretation of the T33. As there are no known schematics, or any clear side photos, the illustrator has speculated on the details and shape of this side of the turret. Illustration by Andrei ‘Octo10’ Kirushkin, funded by our Patreon campaign. 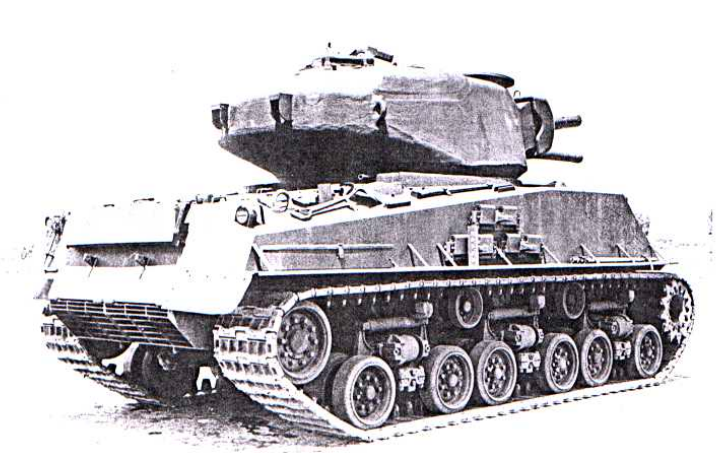 A pre-production run of 20 T33s was planned, with 300 requested for January 1946. There were further aims to construct 600 of the tanks. However, when the war with Japan ended, this was drastically cut back to just three pilots. The particular hull chosen for the T33 pilots was that of the Assault Tank M4A3E2, the famous Sherman ‘Jumbo’. 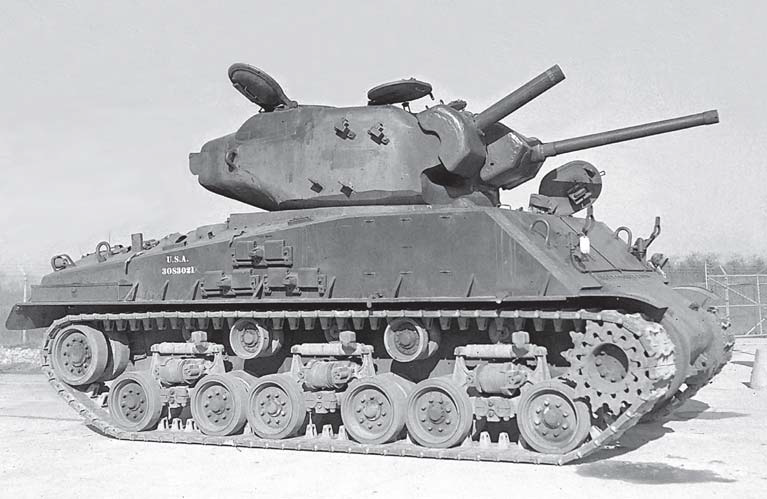 The E2 was famous for having much thicker armor than its standard M4 brothers. At maximum, the armor was 177 mm (7”) thick. The effect of which was amplified by the flat, sloped upper plate. It is interesting to note that the E2s chosen for the project were three of the only four to remain in the United States as all others were sent overseas. The standard Vertical Volute Spring Suspension (VVSS) of the E2 was replaced with the newer Horizontal Volute Spring Suspension (HVSS). This suspension had two-part wheels and used a wider track. For a heavy vehicle, which the Jumbo was, a wider track granted better weight-dispersion on soft ground making it easier to traverse. Although the original Ford GAA V8 power plant from the standard M4A3 was retained, the final drive ratio was increased to 3.36:1. This reduced the top speed to 22 mph (35 km/h), but the tank maintained reasonable acceleration even though it now weighed 84,000 lbs (38,100 kg). It could climb a 60% slope, cross a 7’6” (2286 mm) trench, climb a 24” (609 mm) vertical wall and ford 36” (914 mm) of water. At the end of the war, the T33 was considered the most advanced flamethrower tank in existence. Although slow, work continued on these pilots after the war. The Pilot #1 arrived at Aberdeen in September 1947, Pilots #2 and 3 arrived in January 1948. The T33s took part in tests at Aberdeen, but no further production would take place. Though the T33 did not enter service, the E20-20 and coaxial configuration did. Mounted coaxially with the 105mm Howitzer armed M4A3 (HVSS), it served during the Korean War. In 1953, two of the T33 pilots were converted into the Self-Propelled Flame Thrower T68. This was based on the Canadian Badger project. The turrets of the T33s were removed and the void covered by sheet metal with a cupola added on top. Attached to this cupola was a mount for a .50 Cal (12.7mm) machine gun. A 220 US Gallon fuel tank fed a flamethrower gun mounted in the bow machine gun position. The tank had a crew of three, consisting of driver, commander, and flame gun operator. The T68 took part in a number of tests at Aberdeen but, like the T33, it never entered production. Total weight, battle ready 38 tonnes aprx. you used to have a gallery on the homepage of website with ~5 latest articles. now it is gone. please return it. impossible to find whats new without it! Thnkas! We are currently in the process of repairing the website after a recent hack. Rest assured it will be back soon.